I saw a recipe for Chocolate Banana Pecan Pie but it looked too complicated. Unfortunately or fortunately I am lazy and I like recipes that are simple and easy. Then I remembered I had a recipe for a Chocolate Tart so decided to change the type of nut that was used and added a layer of bananas on the bottom and Bobs your uncle you get a delicious Chocolate Banana Pecan Pie. Now that is what I call simple and easy. 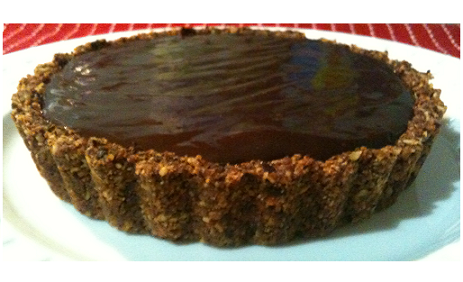 This Chocolate Banana Pecan Pie is gluten free, grain free and dairy free and incredibly delicious. The photos I have taken are just after I poured the deliciously thick ganache over the bananas and got that lovely soft and glossy look from the ganache. Looks heavenly doesn't it. 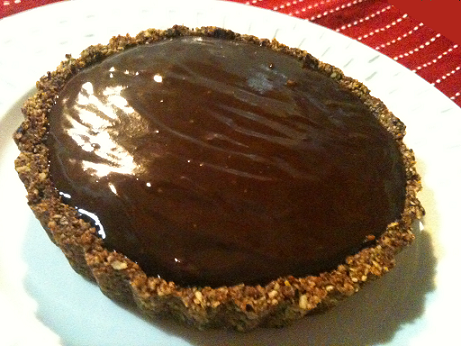 Like you just want to dive in and bath yourself in the ganache! Or maybe it is just me. I will check on them in the morning by then the chocolate will have hardened and they will be ready to eat. Yum! Place pecans into a food processor, and pulse until it turns into pecan meal. Take pecan meal, place into a bowl add cinnamon and salt and mix until combined. Melt coconut oil then mix with honey. Place the coconut oil mixture into pecan mixture and stir until well combined. Grease two 10cm (4 inch) tart tins with removable bases. Divide mixture and press into each tin. Take out of oven and let cool, about 1 hr. Take out of tins. Place in fridge until cold, about another hour. Break up chocolate and place in a bowl. Heat coconut milk then pour over chocolate. Let sit for 1 minute as this will help melt the chocolate. Then stir until well combined. It will turn into a deliciously thick ganache. Try not to eat it all! 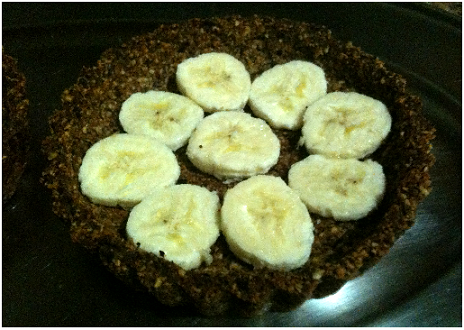 Slice the banana and place a layer of it into the base of each pecan pie crust. Pour ganache over bananas then place in fridge to set. Decorate as you like. I think I will grate some chocolate over the top or maybe do some chocolate curls. Let's see how I feel in the morning. Too good to resist, yum! Bain-Marie or water bath baking method. Tray is half filled with boiled water then placed in oven to bake. I love this dairy free banana custard. It is so easy to make, only if it didn't take so long to bake in the oven. I will definitely been making this again. 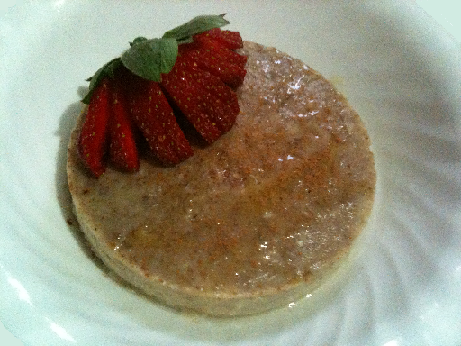 I made the dairy free banana custard with rice milk instead of cows milk. I can't see why you couldn't try any other type of milk, it should all work. You will have to let me know what you try and how you went. It is really light on the tummy which is great so it can be eaten any time of the day even for a late night snack. Mash the bananas with a fork on a chopping board. 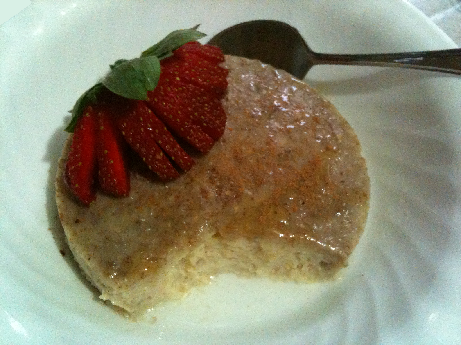 In a small saucepan heat 1 cup of rice milk with 1 teaspoon honey. Do not boil. In a medium size bowl whisk 1 egg with ¼ teaspoon vanilla essence. Slowly add ¼ cup of the milk and whisk into the eggs. Then add rest of the milk, cinnamon and whisk well. Add rest of the bananas and whisk until combined. Pour into two 10cm/4inch spring form tins that have been greased with olive oil spray. 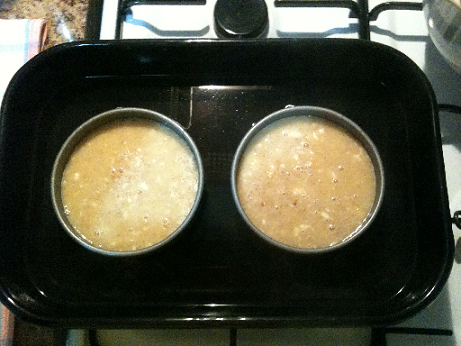 Take a baking tray and place tins inside then pour boiling water in tray until halfway up the side of the custard tins. This is called baking in a bain marie or a water bath. We do this to create a gentle and uniform heat around the custard so it cooks evenly. Open oven door and gently slide tray into oven. Cook for 60 minutes or until custard is set. To serve decorate with a sliced strawberry then dust with cinnamon and drizzle a little honey on top. Yum! Note: These will only last about two days so make and eat asap. Chocolate Peanut Butter Coconut Flour Mug Cake is a long name for a cake I know but that is exactly what I was searching for on the internet but couldn't find so I decided to create it. This treat is gluten free, grain free and dairy free. Then I decided to title it appropriately so other people who were looking for a Chocolate Peanut Butter Coconut Flour Mug Cake could easily find it too. So if you are here congratulations you have found exactly what you have been looking for! Hahahaha. I noticed there are many coconut flour recipes around but they require a lot of eggs and I don't want to use that many. I like to keep it simple. I have also seen many paleo coconut flour recipes but some of them use ingredients I don't like or don't readily have so again needed something simple, quick and easy to make. I hope you have the ingredients I have listed below and you can make this now! I haven't tried it with other ingredients but can't see a problem if you change the coconut flour for almond meal or any nut meal. Changing the coconut milk for any type of milk should be fine too. Change it around and let me know how you go. This is a deliciously moist cake made for one. It is a great little treat that is very light on the belly. Enjoy. In a microwave proof mug add honey and coconut milk and mix until well combined with a fork. Then add in vanilla extract and egg. Next add coconut flour and cocoa powder and mix until well combined with the fork. Scrape down sides and clean up mug then microwave for 90 seconds or until cooked. 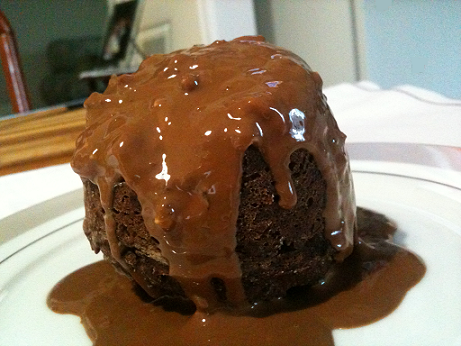 Take cake out of mug and place on a plate. 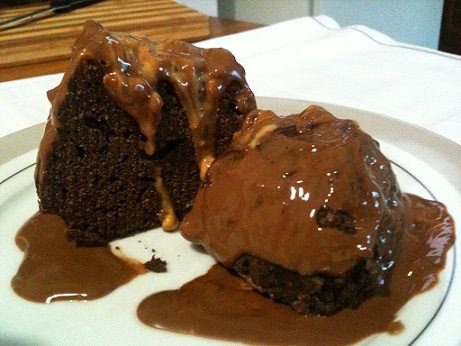 Melt chocolate in the microwave then place a teaspoon of peanut butter on the top of the cake and pour melted chocolate over the top. Enjoy the lovely hot melted goodness. Yum!